This was a great purchase! The rug is super thick and cushy underfoot. The colors are richly saturated and make the rug look far more expensive than it was. Highly recommended. Looks great in my powder room. 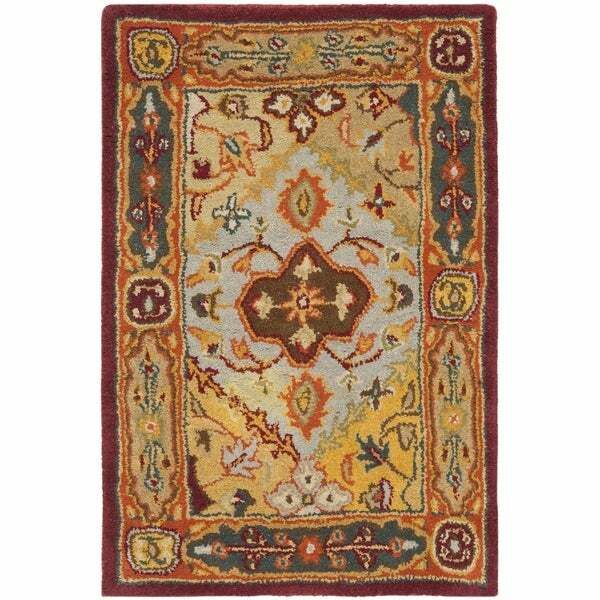 I have purchased several of the Bakhtiari rugs from Overstock because they are so beautiful. This rug was no exception. It is plush and the colors are rich; of course there are many colors in it but the overall color you see is a brick tone. The blue in the middle is lovely and sets of the rusts and reds. Do not hesitate to purchase a Bakhtiari rug in any color if you are looking for quality and beauty. The large one I purchased 2 years ago is in a medium traffic area and looks like new. Of course they will shed in the beginning but that is a temporary inconvenience, well worth the pleasure of seeing such a lovely rug on your floor for many years to come. The rug has too high a nap for the space for which I purchased it--the bathroom. It would have been partly under a cabinet, noticeably tilting the cabinet. I liked the rug, however, and moved it to a different area, next to my bed, as I like the colors and design. It's a nice rug for the price and I may order another, in the next size, for the hallway that connects my bedroom to bathroom. If you're looking for a rug with a high nap, I recommend this one--colors are nice and muted, which is what I like in an oriental rug. I ordered another oriental rug from Overstock, although a different size and design, based on my pleasure with this one. The rug, by the way, was delivered two business days after I entered my order. I finally bought two of these rugs for my kitchen -- in front of the sink and stove -- after a lot of hesitation about the colors. My kitchen has a tomato red and butter yellow palette. The description listed a peach color in the border. The photos showed no peach. I looked at photos of this rug in several sizes trying to determine if this "peach color" would work for me. After reading the reviews, with no mention of peach, I took the plunge and ordered the rugs. I couldn't be happier with them. The colors are much more muted than the photo. They are actually closest to the photo of the 4 x 6 rug. There is NO peach!! It is really an apricot color. Other colors are federal blue, sky blue, khaki, oatmeal, butter yellow, cocoa, sage, light olive and burgundy. Overall, REALLY NICE COLORS that can work with a warm or cool palette. These rugs are thick enough that I don't need the extra pad I was planning on using for them. No noticeable shedding yet, but have only had for 3 days. Good quality, wool rug. Have ordered other rugs from Overstock, and have always been pleased with quality. The colors however, are much less vibrant than picture, but not an issue for the area I'm using the rug. I was amazed at how thick these rugs were. The colors were pretty close to the web photo. Yes, wool rugs shed temporarily. If this bothers you, then order synthetic rugs, not wool. The colors are a little darker than the picture, but it is definitely that rug. I like it better in person. Nice and thick wool rug. Needs a non slip pad underneath for sure. I'm very happy with it. This rug is very pretty and thicker then I expected. The colors are more muted then they appear which worked out great for me. It coordinates well in the area I wanted it for. The biggest difference in the colors that are pictured online and the actual rug is the yellow it is NOT yellow it is more of a gold. I am very happy with rug and plan to buy another Safavieh rug from Overstock very soon. I have the Heritage Diamond Bakhtiari runner and love it! I placed this small rug at my front door and plan to get the 8' x 10' for my dining room. . . .once my pup grows up a little more and stops chewing on rug corners. Cheerful little rug. Colors similar to photo. Pretty little rug and feels pleasant underfoot. The design features so many colors, which makes it versatile for use in a variety of decors.It arrived in just a few days, as did my last rug purchased from Overstock. The price was very reasonable and it comes in a variety of sizes. Color matches other rugs ordered in same style. Arrived on time and is a little jewel of a rug! Another great bargain from Overstock! Love this rug. The quality is GREAT! It will shed a bit at first but overall awesome rug! I have bought a total of 6 of these that are throughout my house. Love these rugs. I bought several for my kitchen. Glad I’m reviewing them because I want more of them. Very sturdy and soft to the touch too. Very comfortable especially in the kitchen by the sink and stove. They wash up nice too. I’ve washed them several times and they haven’t fallen apart. The colors are very nice and not overpowering. Getting a couple more. Well made and beautiful fall like colored rug for in front of my sink. Looks lush and expensive. Non skid backing works well. Absolutely gorgeous colors! I purchased several of these in various sizes for my kitchen. The quality is excellent with easy clean up, too. Everyone notices and complements them. Beautiful rug. Was smaller than I realized which was totally my fault... the size was right there on it when I ordered and it was true to size. But fear not... I found it a home and ordered another rug in a larger size. This is a great rug! I have it in my kitchen in front of the kitchen sink. It gives a nice pop of color in my kitchen. This is a beautiful all wool rug for a fantastic price. I bought two for my guest bath and they add a touch of luxury and interest. Thanks Overstock! Hello nagl, this is made in India. Thank you for shopping with us!